Main difference between Sherwani and Achkan lies in their length, fabric and the massive flare from the waist. Sherwani is little longer than Achkan and is more flared from the waist till bottom and Achkan is more are trimmed & fitted to give a compact masculine look. 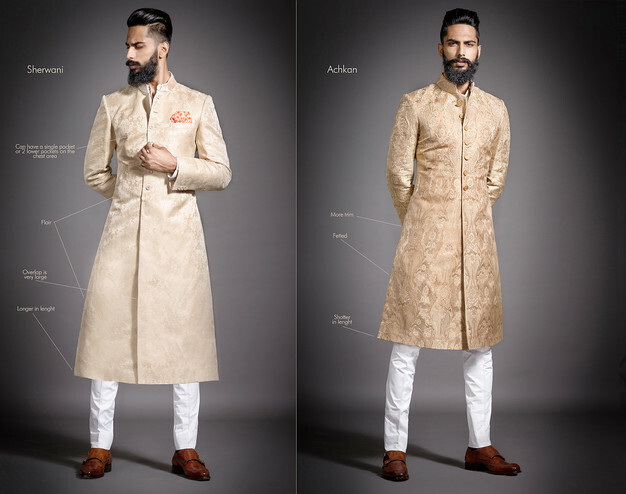 Achkan, the knee-length coat is commonly worn by the grooms during wedding ceremonies or other formal festive occasions as the Sherwani restricts its wearer, who needs to be tall for the flare and the length to fall in the right proportion.